Louder Than Love showcases the impactful stories of Rock & Roll legends, told through the eyes of the historic Detroit Grande Ballroom. Showing at the Sebastopol Film Festival on Sunday, March 24 at 3:30pm. While the West Coast was groovin’ to the sounds of the ‘Summer of Love’ in 1967, Detroit was pumping out a hard-driving, rock sound that was ‘LOUDER THAN LOVE’. The Grande Ballroom stood as the epicenter of the Detroit rock music scene in the late ’60’s. Serving as the launching pad for bands like MC5, Iggy and the Stooges, and Alice Cooper, the Grande also inspired bands from all over the U.S and Great Britain. This is the story of the hallowed halls that started it all, told by the artists and fans that helped create the Grande’s legend. Louder Than Love is an independent film produced & directed by Tony D’Annunzio. 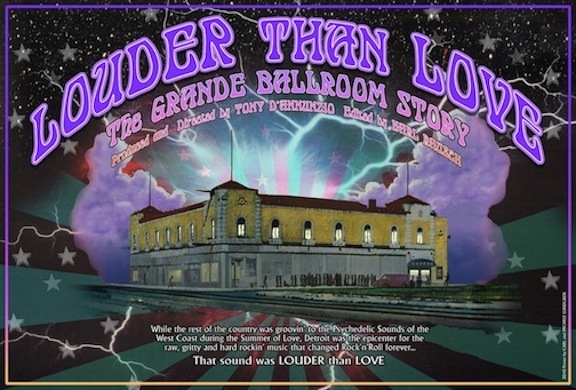 Edited impeccably by Karl Rausch, this is the untold story of the Grande Ballroom. How the vision of one man, Mr. Russ Gibb with the help of many opened the greatest Rock and Roll venue in the world. During the 1960s, The Grande Ballroom was the epicenter for the Detroit Rock Scene. Bands like The MC5, Iggy & the Stooges,Ted Nugent & the Amboy Dukes,The Frost, Third Power, Alice Cooper just to name a few, got their start here. Geri Gillespie liked this on Facebook. Oscar Millarengo liked this on Facebook. Royce Showalter liked this on Facebook. THE GRANDE BALLROOM WAS FANTASTIC….ESPECIALLY WITH CARL LUNDGREN & GARY GRIMSHAW’S FANTASTIC POSTER ART….GOD BLESS THEM…..!!!!! Ted Boiteau liked this on Facebook. Edna Ann Semler liked this on Facebook. PhilandLeesa Danner liked this on Facebook. Stuart Wilson liked this on Facebook.